In HTML5 and CSS3 programming, the hallmark of a CMS is the ability of users with limited technical knowledge to add content to the system. This very simple CMS illustrates a limited way to add data to the CMS. This page allows authorized users to add new blocks to the system. After a few entries, a user can build a complete second page. The system is simple but effective. The user builds blocks, and these blocks are constructed into pages. 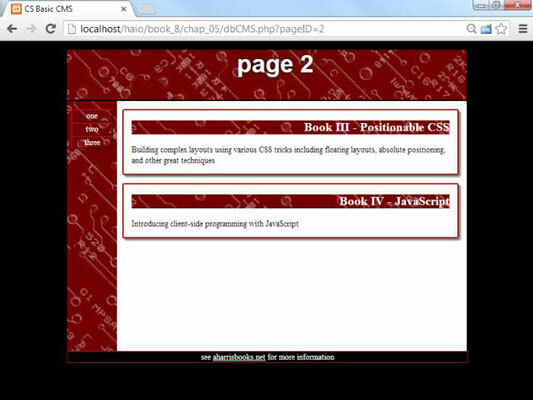 First, look over the buildBlock.html page. Add CSS for consistency: It’s important that the user understands she is still in a part of the system, so include the same CSS used to display the output. You can also add local CSS to improve the form display. 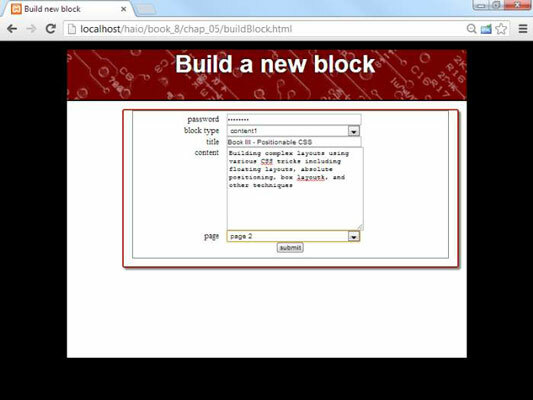 Build a form that calls buildBlock.php: The purpose of this form is to generate the information needed to build an SQL INSERT statement. 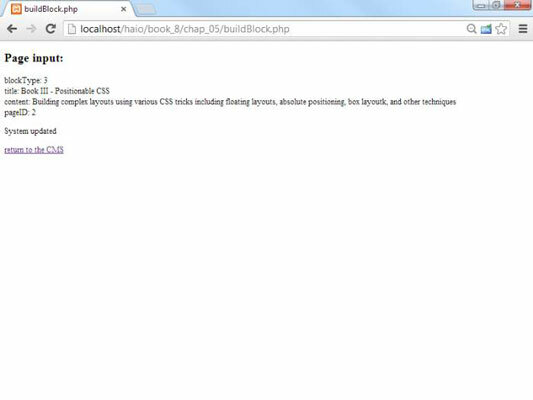 The buildBlock.php program provides this vital service. Ask for a password: You don’t want just anybody modifying your forms. Include a password to make sure only those who are authorized add data. Get other data needed to build a block: Think about the INSERT query you’ll be building. You’ll need to get all the data necessary to add a new record to the cmsBlock table. In a real system, this data would be pulled from the database (ideally through AJAX).